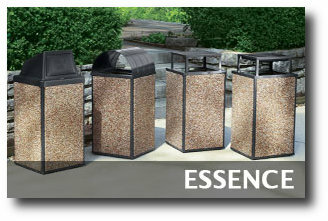 The Essence Collection is an established best-seller among beautiful, natural stone outdoor trash receptacles. Exceptional construction and quality products gives these extremely durable trash receptacles extended product life. Choose from five natural stone finishes set in a polymer matrix concrete providing a long-lasting outer shell. Stone panels are securely mounted in heavy-duty, steel frames for maximum strength. A wide assortment of tops provides many stylish selections to choose from. Various sizes allow accomodations for any traffic needs. Inner plastic liners are provided and are easy accessed with lift-off lids. Cigarette urns are also provided for areas where cigarette disposal is required. Click on the image below to see all of the available stone trash receptacles are offered with the Essence Collection.